I also wanted to try a stencil. The drawing is done with the font "zelfvolution @ eYe/FS." I hope you like them. Info: Created on 20th May 2010 . Last edited on 23rd October 2010. Nice font, a great usage of the new features. Have you thought of using a smaller inner curve, as it looks a bit fat on the corners at the mo. ¡Este es brillante! This is freaking awesome! 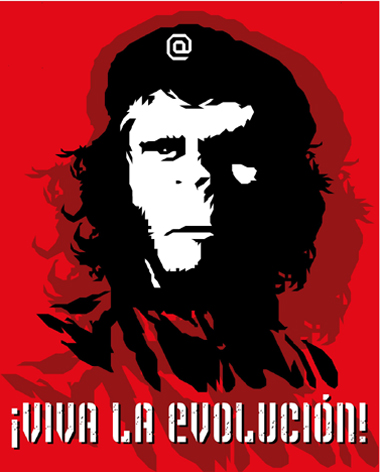 I didn't know this Che Gorilla version before. The font itself is sublime. I like the mixing of the few lower case glyphs, and the touch of decay. A good, strong stencil - well worth a 10. 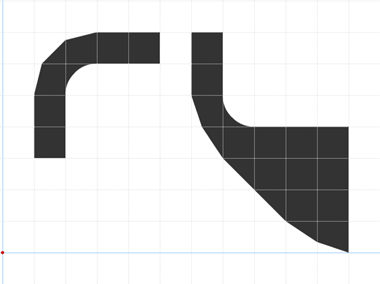 The only glyph that I wasn't 1000% sure of is the G ... for me, the descender is a wee bit long. I am always very grateful with all the comments made about my fonts, and in this case especially. I'm working in the curved sections and also in the G. Thanks again for your help and all the time you have used seeing my works. Your help and your support is always crucial. Actually, I quite like the "G", but the descender may not be consistent with the rest of the set. Be careful to make it different enough from number 6. I've tried a new "G", according with the "E". It isn't a 9, it isn`t a S... It works in many aspects. What is your opinion about it, please? Yes, I like this new G. I thought you were to axe the descender, but keep the G otherwise. Instead, you've created a quasi-lower case version to add more excitement. It goes well with the e,m,n,y. One notable omission is the 'a'. You can actually have two versions within the same font: one upper case, and one quasi-lower case. I'm happy that p2pnut prompted you to think again about the G.
And here is the new "A". The font is living, grow up; please, tell me your opinion about that. Thanks a lot. I'd have the Capital 'A' where the lower case 'a' is, same with the G. It will work better. I think you are right and this way is the most convenient. Thanks, I could improve very little without the great help from you. Any other suggestions would be welcome here. Cool stencil font !! Perhaps it should be more trash, i don't know. Smaller inner curves added. The font continues improving with your comments, thanks. One of the great strengths of FS is the way support and advice from our fellows helps us to stand back and look at some of the fine detail. We all benefit from observing this process. By the way, the original G was very good (as a G), but as Frodo7 said, maybe not for this design ... which just keeps getting better. @ Upixel: you hit in the bull's-eye: my first intention was to make each glyph different, and my lack of effort that I have not succeeded it (I beg your pardon, my english is disastrous). This font is moving, folks! You're moving it. Still moving forward! You will be always the first. What I'm thinking now about it is filling the gaps that I owe to the lower case characters with all these pretty strange things that happen here ... is a reasonable idea, you don't think so? Congratulations! FontStruct Staff have deemed your FontStruction worthy of special mention. “zelfvolution eYe/FS” is now a Top Pick. we're you asking me a question? if so I did'nt get it on your last comment ? je pense que tu parles espagnol non ? I've been seeing this in the live feed for some time, but I didn't realize that it was so small! 10/10! @ UpPixel: BrldBrldBrld ... I have no idea what I meant by that last comment, fatigue and sleep are my excuses, I hope you accept them. Please forgive me for not having answered before your question, but I've been almost two weeks without a computer (and not to use other computers either at work). The truth is that my idea was to fill the font with different designs for other more glyphs. Y, si, mi lengua materna es el español; si usted lo desea, puede utilizarlo conmigo. Thank you very much for the time you spend with my little work produced by an apprentice typesetter. Once again I thank FS Staff for having seen something remarkable in one of my rookies fonts. I can only promise them that their eyes never tire of them with designs it worse, and I apologize in advance for that. A lot of thanks for everything, and especially the FS colleagues who have helped me in it: the greats djnippa, Frodo7, p2pnut, Upixel and other. Without them there would have been possible for me to get it. Thank you, compañeros (comrades)! @djnippa: Yes, we have been discussing it. Thus, the lower case could be a redesign of the upper case but adding a new glyphs "bited" for the stencil to facilitate involving more than one version of each glyph to make with its a variable logo or a most readable poster headline, avoiding in part the effect of computer font who Upixel as refered recently. We are on all it. In fact I live in North America... and When we go south of US everything (mostly) is in spanish. @ Upixel: Thank you for your attention to the double question marks and exclamation marks, Spanish is almost certainly the only language that these are so used, at the beginning and end of the sentence. 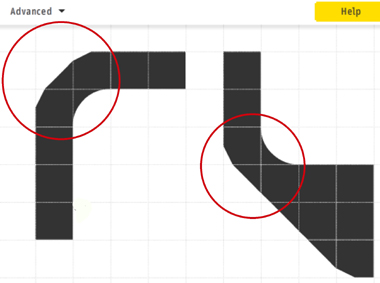 By the way, I take this opportunity to ask for help once again to the Greats FS (and also other colleagues), please: I need to know if these corners can be rounded in a 1:1 grid. The font is finished, but I am unable to find another solution. Help me, please, I promise pay you with... better fonts (and eternal gratitude). Second try ... Better, but not enough. I ask again for the help from some fontstructors who knows or can indicate me a possible improvement. Thank you in advance. Well I may have a first step of a solution. 1. This option keeps the triangle at the end joint and replaces the adjacent bricks with two thick ends of a 1:4 angle set. 2. 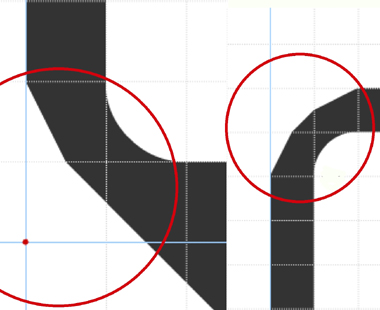 This option thickens the diagonal line at the bottom and joins it to the vertical with a combination of the thick end of a 1:3 angle set on top, followed by the thin end of a 2:3 angle set directly below, giving it a rounder feel if that's what you were going for. @geneus 1: a million thanks for your suggestions. Soon I will publish the font, it's nothing spectacular, I notice, but I found a number of problems with this font and I really enjoyed myself get going to solve these problems with FS. Thanks again for your help, master. @Upixel: Thanks again for your efforts. At the end I opted for the solution proposed by geneus 1... with some tiny differences. But I'm still looking to improve this kind of corner in a 1:1 grid. I do not know why but I have the intuition that there may be a solution to this problem and we have not yet discovered it, I think. OK, we are on the block. You're OK, thanks, compañero FS. Another twist, similar approach. 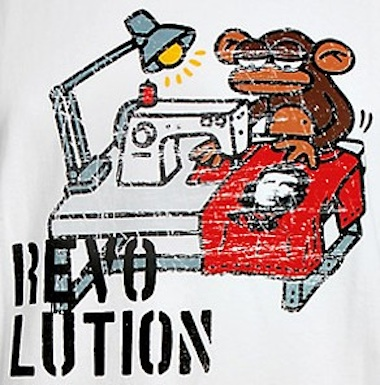 This is part of the Summer 2011 collection presented by Kukusumusu the well known (at least in Spain) t-shirt shop.